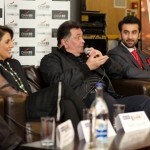 The team of Abhinav Kashyap’s Besharam came down to the UK to talk about their fortcoming release. Our good friend Sujoy Singha from Bollypop, attended and managed to even liven up the proceedings at the press conference. Here’s the audio of the event with Ranbir Kapoor, Pallavi Sharda as well as Rishi and Neetu Kapoor. The podcast is below but here are some of the things they talked about typed out by the friendly people at Sterling Media. You can find more of Sujoy’s work on BollyPop or OneKnightStands or Follow him on twitter on @9e3K. Besharam releases worldwide on 2nd October 2013.